Behind every “irrational” fear is a rational explanation. For instance, many people are afraid of bees because they experience a dangerous allergic reaction if stung. Other people who are afraid of the water cannot swim and worry about drowning. Online journal, Registered Dental Hygienist, says that negative experiences accumulate over time, adding up to a “I hate all dentists.” attitude. Careful dental care and a kind, patient-centered attitude are critical to a positive experience for every individual. 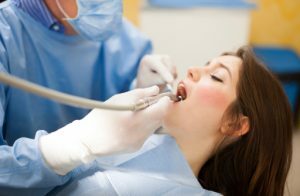 Your sedation dentist in Chicago can help patients approach the dental office with trust and confidence that dental work will be comfortable and correctly performed. Dr. Joseph G McMartin has been in practice in Chicago since 1984. As such, he has seen it all in terms of dental phobia. He knows that your oral health benefits from a kind, listening attitude and an office that provides quality care in a comfortable setting. He offers truly pain-free dentistry. Of course, the traditional “pain shot,” or local anesthetic numbs areas to be treated with fillings, root canal therapy and even dental implant placement. However, that intervention is not always enough; so the team offers oral conscious sedation. Prior to an appointment with Dr. Joe, the patient takes a prescribed oral tranquilizer. The names are familiar to most people: Halcion, Valium, Ativan, Versed are just a few of the choices.The beauty of the medication is how it relaxes the fearful patient, making him or her drowsy, even to the point of napping in the treatment chair. Dr. Joe and his team are able to perform routine exams, cleanings, fillings and other dental services while the individual is completely at ease. The patient can respond to simple verbal commands and afterwards, may not remember having the dental work done. A friend or loved one must drive the patient home. Contact the offices of Joseph G. McCartin DDS, and book a sedation dentistry consultation. It’s your first step toward superior dental care and elimination of dental fears. Your beautiful smile will thank you for it.